In September of 2016, Elon Musk unveiled his vision for a super-heavy launch vehicle, which would be SpaceX's most ambitious project to date. Known as the Big Falcon Rocket (BFR), this massive launch vehicle is central to Musk's plan of conducting space tourism with flights into orbit and to the Moon. It is also intrinsic to his vision of sending astronauts and colonists to Mars. Ever since, the astronomical and aerospace community has been paying close attention to any updates provided by Musk on the BFR's development. 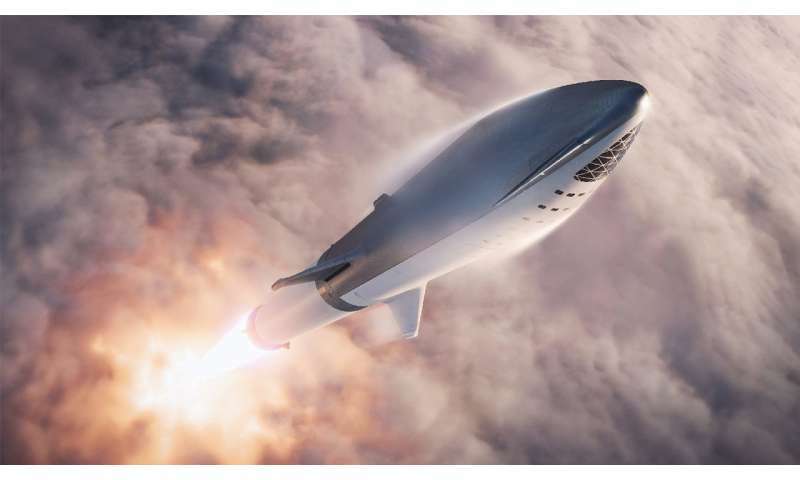 In his latest update, which was made via Twitter, Musk indicated that his company will be building a small, winged version of the massive spaceship component – the Big Falcon Spaceship (BFS) – which will be launch-tested using a Falcon 9 or Falcon Heavy rocket. Musk indicated that this would be part of the "SpaceX tech tree build", the purpose of which is to ensure that the company's engineers and personnel gain valuable experience with the BFR's new design and recovery strategy. According to Eric Ralph of Teslarati, its intended purpose is also to act as developmental stepping stone between the Falcon 9 and the BFR, which are two very different launch vehicles that rely on different technologies. In addition to being much more massive than the Falcon 9 and Falcon Heavy, the BFR will be a single system, consisting instead of a massive first stage booster and an equally massive second stage spaceship (the BFS). The design also calls for actuators on the front and two on the three rear fins to help control the rocket through a variety of atmospheric densities and velocities. "It seems likely that the miniature spaceship will essentially just be a strengthened Falcon 9 upper stage with fins and a heat shield attached versus a more extreme departure, where the stage would literally be a mini-BFS." The former scenario appears more likely, he claims, as it would take additional time to miniaturize all of the new technologies that will be going into the BFR. These include the carbon-fiber deep cryogenic liquid oxygen propellant tank and new propulsive landing techniques that will function in vacuum or in a thin atmosphere (i.e. on the Moon or Mars). However, this test will still be an opportunity to validate key technologies of the BFR, such as its actuated tripod fins, heat shield and other hardware components. Musk also indicated that the mini-BFS would not land under its own propulsion (as the Falcon 9 and Falcon Heavy do) due to the Merlin vacuum engines having a thrust-to-weight ratio that is too high. 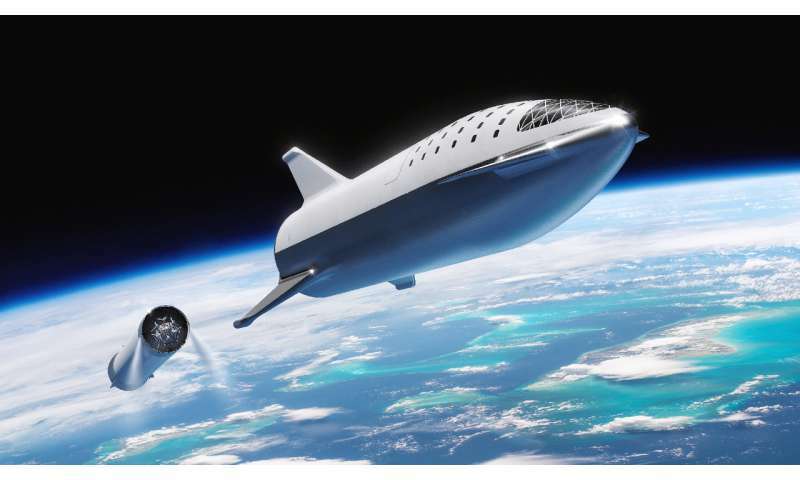 Instead, Musk said, what the mini-BFS will be conducting is essentially a supersonic and practice reentry to test its lightweight heat shielding and high mach control surfaces. He also indicated that this would not be a propulsive landing because of his company's track record retrieving the first stages of the Falcon 9 and Falcon Heavy. "I think we have a handle on propulsive landings," he tweeted. Based on twitter statements made by Musk back in April, the plan to recover the mini-BFS will apparently involve bringing the "rocket upper stage back from orbital velocity using a giant party balloon," followed by "And then land on a bouncy house." For the record, he preceded these statements by saying, "This is gonna sound crazy, but…" So we can assume he's being serious. According to Musk, the tests will be taking place at the SpaceX South Texas Launch Site, which is currently being built in Boca Chica Village, Texas. Interestingly enough, the proposed launch date coincides with the launch of the first SpaceX's Starlink satellites – a constellation of satellites that will provide global broadband internet access. According to a recent report from Reuters, the first batch of these satellites are also scheduled to launch in June of 2019. As Ralph speculates, this could mean that Musk intends to test the mini-BFS by transporting his own company's satellites into orbit. This would make sense, in that it would allow SpaceX to test the BFS' capability to deliver cargo into orbit while ensuring that company incurs all the risk (rather than a commercial partner). It is an exciting time for the NewSpace community and space exploration enthusiasts. Between SpaceX, Blue Origin, Virgin Galactic, and other private aerospace companies, some rather significant strides are being taken. With every passing year, the possibility of space tourism, lunar tourism, and even regular missions to Mars appear to be getting closer. Interesting! The upper stage engine makes the cylinder bottom heavy, which should mean the fins will be shifted relative to the BFS sketches. Else it looks like a straight forward test series of broadside "skydiver" reentry after the fairings and payloads have been released. "Based on twitter statements made by Musk back in April, the plan to recover the mini-BFS will apparently involve bringing the "rocket upper stage back from orbital velocity using a giant party balloon," followed by "And then land on a bouncy house."" Unlikely, the mod is a change to (at least some) F9 upper stages that supersedes the earlier plan. Besides, the fins and heat shield will be tested with the skydiver bringing back, which will make the empty stages go subsonic at terminal velocity. If they retrofit the test to all upper stages (but why?) they could possibly attempt the fairing recovery method - they would presumably like to catch the test stages to study the heat shield response in detail.